The EEC High-Speed Bio Tec WWTP system is fully automatic, clog free, and based on MBBR technology. Biodegradation and sedimentation technology which is unique due to its compactness and performance in respect of volumetric efficiency. EEC utilize the AMB Bio Media™ with effective bio surface of 550 m²/m³. These technologies are combined in a prefabricated, skid mounted or containerized tank system with variable length, suitable for overseas transportation inside or as ISO freight containers, MBBR work extremely well with high strength organic loads. Process Description The treatment plant will take suction from the pump well by its own feed pump. 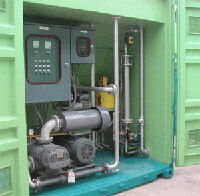 The pump is level controlled and has a capacity which is 2-3 times the average daily flow. The plant has therefore an intermittent working mode in terms of hydraulic flow, while the air blower supplying air to the bioreactors is continuously running. The biodegradation reactor comes with various chambers depending on required cleaning efficiency. The bioreactors degrade the dissolved organic matter by oxidation into carbon dioxide which escapes to the air, and to produced biomass which acts as activated sludge. A suspended, free floating biofilm carrier medium provides a large, protected biofilm surface and simultaneously accumulates the active biosludge inside the reactors. The biodegraded water flows into a clarification stage where the suspended solids settles by gravity. The water is directed through a skim well to a settler system which provides the final clarification of the effluent For systems with high cleaning efficiency, EEC can configure package systems to meet your exact requirements, Animated flow & More.